Addis E. Hull acquired the Acme Pottery Company in Crooksville, Ohio in 1905 and the business was renamed A.E. Hull Pottery Company. Like other early potteries, take Fulper Pottery as one example, Hull got its start making utilitarian items such as stoneware, semi-porcelain dish sets, and decorative tiles among other useful household goods. The company branched out into art pottery approaching the 1920s and expanded the business to include a showroom in New York, offices in Chicago and Detroit, and a warehouse in New Jersey in addition to the Crooksville factory, according to the Hull Pottery Association's website. Hull also began to include art pottery production around that time using a wider selection of colors and glazes. They captured a fair market share in the pottery trade as the business continued to expand. When A.E. Hull died in 1930, his son Addis E. Hull, Jr. took over as manager. He continued with the company until 1937 when he left to take the reigns as general manager of Shawnee Pottery, a competitor with Hull. Gerald F. Watts took over as the manager of Hull at that time. The company also began producing pottery containers for cosmetics in 1937, including those made to hold Old Spice shaving products for men. The late 1930s through the 1950s saw what collectors reference as the company’s best work, including many clever figural cookie jars introduced in the early 1940s. 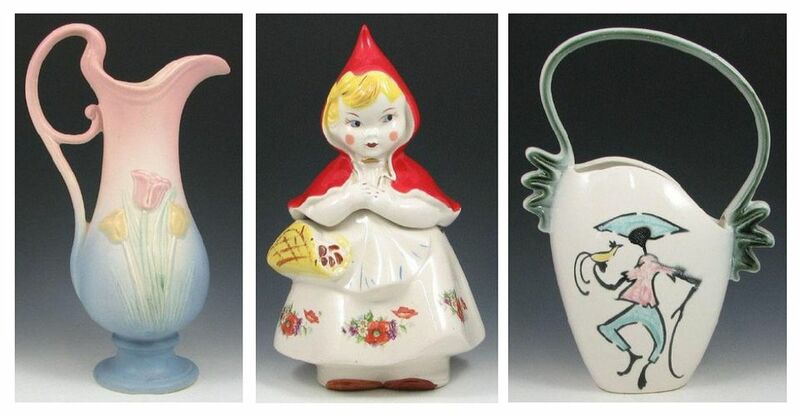 The Red Riding Hood line is the most popular (although many copycats and reproductions abound so be aware when shopping for vintage goods) among these figurals. Art pottery lines made during the 1940s had mainly floral décor, and many of these pieces had the familiar matte pastel finish collectors recognize as Hull. The company also made a variety of figural pottery vessels for use by the florist trade from the 1940s through the 1960s. A flood and fire in 1950 forced the factory to close, but it reopened in 1952 as The Hull Pottery Company, according to Warman’s Antiques & Collectibles 47th Edition edited by Noah Fleisher. Most of the items produced by Hull after the reopening had a glossy finish and most were trendy figural styles so popular in the 1950s such as the Tropicana, Ebb Tide, and Parchment and Pine lines. The company’s focus from the late 1960s through the 1980s was House 'n' Garden serving ware and Imperial florist ware. The business closed in the mid-1980s (some sources say 1985, others 1986) due to multiple union strikes and foreign competition, as reported by the Hull Pottery Association. Early Hull stoneware pieces were marked with a capital “H” inside a circle or a diamond shape which was incised into the ceramic material. This makes Hull's lines distinguishable from other stoneware made in the early 1900s. Warman’s notes that pre-1950 vases are marked “Hull USA” or “Hull Art USA” on the bases, and may still have paper labels in place as well. Pieces made after 1950 were marked “Hull” in large script or “HULL” in block letters. Recognizing the difference in the marks helps to date these pieces. In addition, each pattern has a distinctive letter or number associated with it. For example, the Wildflower pattern has a “W” and a number, while Poppy has a number in the 600s. For more information on Hull Pottery patterns and examples of marks, Warman’s Hull Pottery Identification and Price Guide by David Doyle (Krause Publications) is a great resource. Many different Hull pottery items have been reproduced ranging from wall pockets to piggy banks to Red Riding Hood cookie jars. Most, however, differ from the original pieces they mimic in one or more ways. Sometimes the color is vastly different or the details in the décor don’t match up with pieces known to be originals. Other times the marks don’t even resemble an original Hull mark. The best way to learn to detect Hull fakes is to become as familiar as possible with genuine pieces. Most of the fakes will begin to stand out fairly easily then, just as they do with Roseville pottery reproductions. One exception is the Hull Bow Knot B-29 basket, as reported by Hull Pottery Association. The color and detail on this piece could almost fool an expert, but when examining the size closely it’s not quite right. The genuine Bow Knot B-29 basket is 11 3/4” inches tall, while the reproduction version measures just 10 1/16” tall.